Open & Hybrid Publishing pilot, on air! 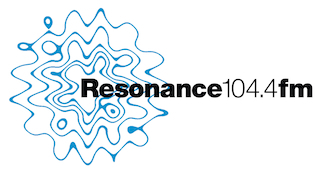 A programme entitled Making Conversations broadcasted by the British Radio Resonance 104.4fm included Europeana Space, on Tuesday 21 October 2014 (and repeated Saturday 25th). The speaker Bronac Ferran discussed new models of hybrid publishing in the internet era with guests Doug Sery, Senior Acquisitions Manager for New Media, Games Studies and Design at The MIT Press; Professor Joanna Zylinska of Goldsmiths Department of New Media and Communications, author of “Bioethics in the Age of New Media;” and Ben Pester, Podcasting Coordinator at Goldsmiths. The programme tried to answer questions such as: What are the new models in relation to business, knowledge and information-sharing which are influencing academic publishing today? Can we start to predict future trends? What needs to change, when and why? Joanna discussed there, among other things, the Open and Hybrid Publishing pilot, and located it in the context of the Europeana Space project as a whole. Similarly to the various humanitarian and science fields involved in conducting scientific research, the developed study activities fo the educational programme integrate different subjects: history, arts, religious studies, Social Studies, native language, mathematics, and chemistry. As an exciting and playful aspect, the children will operate as art detectives while solving the assignments. E-Space WITH is an innovative concept for an infrastructure, which exposes APIs from different portals and repositories. 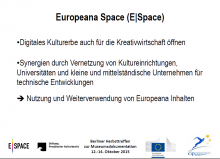 It allows the user to search content of interest from a single access point into different and disjointed repositories and databases such as Europeana, the DPLA Digital Public Library of America, YouTube.. and of course the Europeana Space own repository, currently under construction. 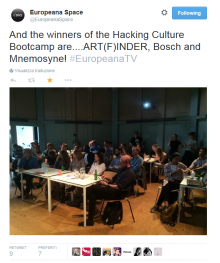 Hacking Culture Bootcamp SUPER-success in Amsterdam! This weekend the first E-Space hackathon took place in Amsterdam, from the evening of the 8th until the 10th of May. 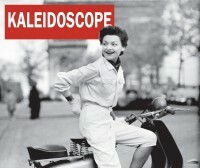 The event, organised by the Europeana TV pilot of E-Space project, was challenging game and app developers, storytellers and interactive designers to create new multi-screen experiences with a focus on digitised historical footage. Winners will now fly to London for an intensive Business Modelling Workshop! The STARTS Residencies Program organises collaborations between artists and tech projects, APPLY NOW! Open call for STARTS residencies!